The Blue Lorikeet has been recorded foraging for insects on the undersides of leaves, a behaviour quite unlike other parrots. Both adults in general dark purple/blue; paler blue on long feathers of crown and occiput; white face to upper breast. Bill orange. Eye yellow/brown. As in adults but underparts dark grey/blue, no white. Bill black. Eye dark brown. Repetitious and high-pitched. Also three syllable whistles. Small, planted aviary, with many branches for the birds to climb on. Nectar, either commercial or homemade (mixture of lactose-free baby cereal, honey, and malt extract or molasses, mixed with filtered water, made fresh once or twice daily); fruits such as: pomegranate, apple, pear, orange, cactus fruits; also sweet corn. Provide areas for bathing, provide lots of branches for climbing, swings, ladders and unsprayed flowering branches. Most likely threats are introduced predators, such as black rats, cats, and swamp harrier. Recent hurricane activity has also reduced numbers. Occurs on Society Islands and W Tuamotu Archipelago; formerly further afield. Introduced to Aitutaki, S Cook Islands. Found in coconut plantations or gardens with flowering banana and mango trees. On Aituaki, where introduced, this species prefers mixed woodland with banana trees and coconut palms, plantations with shade trees and tall forest. Birds feed on pollen, nectar and soft fruits, with flowering coconuts and bananas being preferred. Also may take insect larvae. 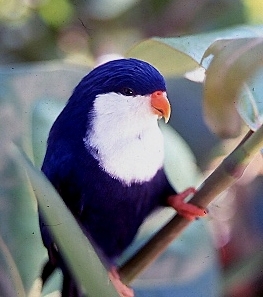 Relies on the coconut palm Cocos nucifera for feeding and nesting. Are very active. Seen in small groups of up to 10 birds flying between flowering coconuts. Birds can be confiding.